Airfoil caption: A close up of the shield carried on the nose of the previous Me 163B 'Komet'. 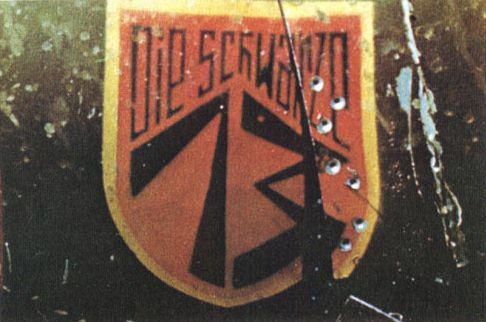 "Die Schwarze 13" translates to "The black 13". it would be very easy to mistake the German "1" for a "7", however, a Germanic "7" would usually have a small "tick' across its leg. It is not known if this is the personal marking of a pilot or an unknown Staffel emblem? The colors used are Red 23, and Yellow 27 and Black 22. Note how the 81 and 82 have been applied behind the shield. I've long thought this photo showed 7 bullet holes, but due to their symmetry I now think they are countersunk rivets that popped out during the explosion that blew up this aircraft.